The first PTM for the academic year 2012-2013 was conducted in all the five schools. It was well organised. The teachers introduced all the activities and curriculum to the parents.. They were very happy and satisfied with all that the school is giving their child. They expressed their gratitude towards the sponsors’ and Building Blocks for providing such an opportunity for their children. The inter school teachers meet was held on the 1st of September 2012. Teachers and managers from all the five schools attended the meeting to discuss and share various operational experiences. Curriculum supervisors shared important observations and opened the floor for discussion and input. The meeting equipped the teachers with better classroom control plans as well as effective lesson plans. 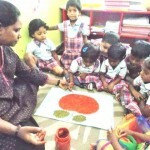 The children are learning about different colors and their names. The levels – low to high. Little Musician is designed to be a pre- music-lessons music education. Instead of focusing on musical performance as later instrumental lessons do, it simply teaches children to correctly hear and understand musical language. Children are taught the basics of melody, harmony, rhythm and meter in a structured manner that builds their musical language skills. With the introduction of Brillkids little musician the children’s interest level for music has grown. They enjoy performing, singing and clapping to the beat. Children at Jr.KG level did activities like leaf bracelets, pipe connectors, textured writing, smelly bottles, shadow watch, hot & cold pennies to understand concepts of big, small, hot. cold, few, many, large, hard, soft, rough and smooth. Children are also thrilled learning about Fireman and Policeman. As part of their phase 1 curriculum they are learning about good table manners. In social studies they are learning all about their country India. The national symbols, animal, fruit, bird, tree and the physical features it has. Character development lesson for the month included Thoughtfulness, which they learnt through the story of “Ant and the Dove”. Phonic sounds this month for Sr.KG included, diagraphs ‘qu’ ‘ou’ ‘oi’ ‘ue’ ‘er’ ‘ar’. To enhance children’s English language skills Genki lessons on “Do you like animals” & “Do you like vegetables” were taught through songs. In science they are learning interesting facts about their body through the book ” MY BODY”.